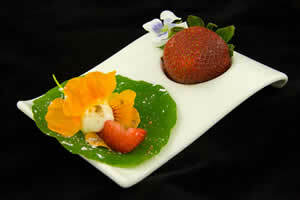 Edible nasturtium flower stuffed with sweet cream cheese, a wedge of strawberry and dusted with cocoa and sugar. Serve chilled upon a Nasturtium Leaf. A relative of watercress our Edible Nasturtium Flowers have sweet petals and a spicy back. The colors range from yellow to deep red. The yellows and oranges almost neon keep longest. Plants grow best in cool but high light conditions, difficult outside but our greenhouses provide the ideal environment. Both the leaves and the flowers are edible as well as imature seed pods which can be used as a caper substitute. We place the flowers in some of our jellies for a beautiful color infusion and a bit of spice. They can be stuffed with a sweet or savory filling for and exotic dish fit for a king.